November 06, 2018: Italian watch brand wonder, D1 Milano is proud to announce the addition of another jewel to its crown – ‘The Khaleeji’, designed exclusively for the Middle East. The Limited Edition timepiece comes in a stunning Rose Gold finished stainless steel case, with a full metal bracelet, completed by a custom-made metallic green dial with Rose Gold Arabic indexes uniquely made for this edition. Details make all the difference in this piece, from the green stone meticulously applied on the crown, to the laser engraved Mashrabiya on the back case, each timepiece is uniquely presented with Arabic numerals on the dial. 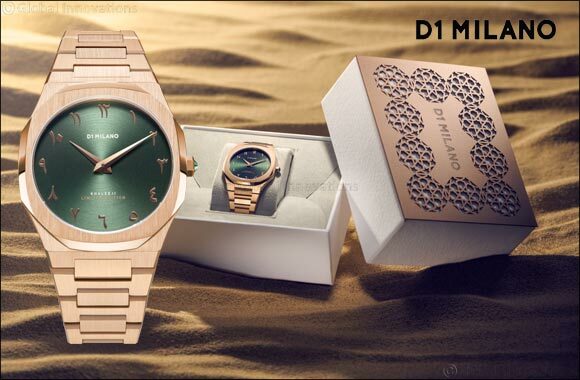 The packaging itself is a representation of the iconic Mashrabiya, a traditional element in the Middle Eastern architecture and also appears on the back of the timepiece. Finished in a Rose Gold accent that gives a special touch, this new packaging is bound to appease any watch lover. The Khaleeji line took all of three months to come to life following a stringent research and development process to ensure the Middle Eastern traditions and architecture were meticulously incorporated in the design. The limited edition line has only 500 pieces and will retail both online as well as physical stores across the region. The Khaleeji is priced at AED 1,800 will be available to shop starting 19th October 2018 onwards.